customer experience Archives - KB Concepts P.R. This guest post by my niece Jessica doesn’t cover my usual subjects of choice: PR, branding, social media, entrepreneurship or awesome women business owners. But it does cover something hugely important to the success of all of these: the critical importance of providing good (and consistent) customer experience. Fail at that, and you risk turning a promoter into a detractor. My name is Jess. That tidbit will be important later. I went into the same coffee shop, every day, sometimes twice a day. I LOVE the coffee and I am willing to spend to get the perfect cup. On this one day, I ordered one for me and one for a friend. Gave my name and paid. Then I waited. Barista: Theresa! One grande hot, one venti iced. . . I’m still waiting. Barista then tells me, ”These are your coffees.” To which I reply, “But my name isn’t Theresa, it’s Jess.” Which prompted an, “Oh well, still your coffees.” I took them and left. After one sip, I realized what I had was drinkable, but not what I had ordered and paid for. When I got to work and handed my pal her drink, I told her they had called me Theresa. “Look, here, it’s even on my cup!” I also mentioned my dismay that even though I go to the same shop every day they didn’t recognize me. And on top of that, they got the order wrong. She laughed and snapped a pic of the cups and off she went. When I returned to my desk, my phone was blinking madly. It appears that my pal posted the picture of the cups online. Her Instagram is tied to her Twitter and Facebook feeds. In the hour I was in a meeting the photo received a ton of attention and NONE of it positive. Her friends, my friends, our friends’ friends, it even appeared on my LinkedIn page. Recall the vendor? He told his colleague that generally joins us but was away. That colleague posted a note to me, which garnered more attention. People were well aware we were not happy and they commented and they shared and they tagged and hashtagged… “Don’t flip the table, Theresa,” and “Let me tell you what they did to me,” and, “You did not get what you paid for” . . .
What went wrong? They didn’t listen when I ordered and they didn’t listen when I said I was not Theresa. They made no attempt to correct the name or double check the order, they simply did nothing. How did I feel? I was disappointed, since I love my coffee and had looked forward to it. I felt unvalued and unappreciated as a customer. I was willing to spend and I was loyal, I went twice a day. Why was my loyalty not rewarded? What did I do? I told everyone I came across for most of the morning. It was online for all to see. The coffee shop lost control of the negative feedback. They couldn’t stop it. It was too late to fix the coffee or my name. Word of mouth is the fastest and most powerful mode of advertisement, moreso when it’s negative. Click to tweet. This all stemmed from a poor customer experience. What would have happened if they got my name and the coffee right or had offered to fix the issues? I would have taken my coffees and gone on with my day. . . and gone back the next day for another cup. 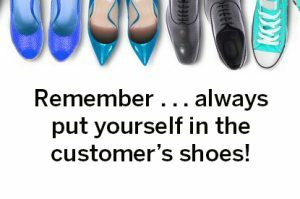 If my work in customer experience, both here and at another large insurer, has taught me anything, it has taught me this: always put yourself in the customer’s shoes. Always look at the interaction from the customer’s point of view. That’s the foundation of delighting your customer and turning her into a promoter (an actual category from the Net Promoter Score survey we use to gauge our progress as a company). Do the opposite and you’ll create the opposite: a detractor. So, now that you’ve heard my coffee story, I hope you’ll share one of your own!